The panelists discussing immigration called on everyone to work together for comprehensive immigration reform. 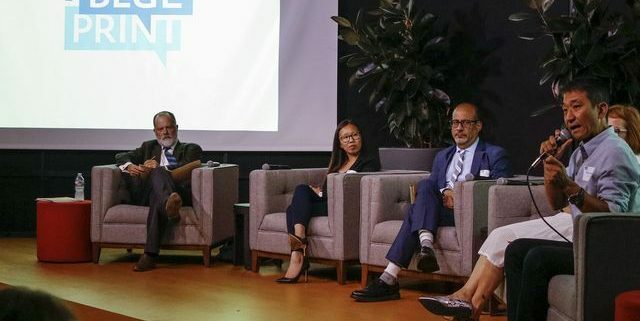 As the country reckons with President Donald Trump’s decision to end the Deferred Action for Childhood Arrivals program, expert panelists discussing immigration at a UCLA event Sept. 12 noted that now is the time for everyone who supports immigration reform to advocate for legislation that would protect those who are undocumented. Zhou was speaking as part of “Public Discussion: L.A. Leaders on Immigration and Civic Action,” which included immigration experts from UCLA and beyond, all trying to make sense of what transpired a week ago and what needs to be done now. Hosted by the policy magazine UCLA Blueprint, in conjunction with the UCLA Luskin School of Public Affairs and UCLA Advocacy, the discussion featured Abel Valenzuela, director of the UCLA Institute for Research on Labor and Employment; Dae Joong Yoon, executive director of the National Korean American Service and Education Consortium; Maria Elena Durazo, longtime Los Angeles labor leader and immigration activist; and Zhou. Blueprint editor-in-chief Jim Newton moderated. On Sept. 5, the Trump administration announced its decision to rescind DACA in six months, a move that would affect nearly 800,000 young adults across the country. These people, who are often called Dreamers, were typically brought to the United States as children, and have worked to gain access to higher education and a job, while maintaining a clean legal record (no felonies or major misdemeanors). Valenzuela, who is also a professor of Chicana and Chicano studies and urban planning and has authored numerous work on day labor and immigrant labor markets, lamented that it “took years to get [President Barack] Obama to finally change his mind” and create DACA. Rescinding the order is “not politics as usual in any way,” he said. Durazo’s experience has spanned decades, working in the hotel employees and restaurant employees union back in 1983, and then as the vice president for UNITE HERE International Union. In 2003 she became national director of the Immigrant Workers’ Freedom Ride, a campaign to address immigration laws, and from 2006 to 2015 she was the first woman elected executive secretary-treasurer of the Los Angeles County Federation of Labor. All that experience leads her to the belief that the public needs to examine the immigration issue beyond just the current administration. Despite their concerns the panelists implored the crowd to remain positive. The event comes on the heels of a push by UC system leadership to convince members of the House and Senate from California to get an immigration reform bill through Congress. Yoon just returned from a 22-day vigil in front of the White House. There, he spoke to many non-immigrants. Yoon said he was hopeful because many were able to open up their minds on the issue. He was part of the founding of the National Korean American Service and Education Consortium in 1994, with successful campaigns including the “Justice for Immigrants” Washington Post ad campaign that opposed anti-immigration legislation. Now, efforts must be focused on Congress to pass comprehensive immigration reform that protects those eligible for DACA. Durazo called for business and education leaders to amplify the message of Dreamers and comprehensive immigration reform. 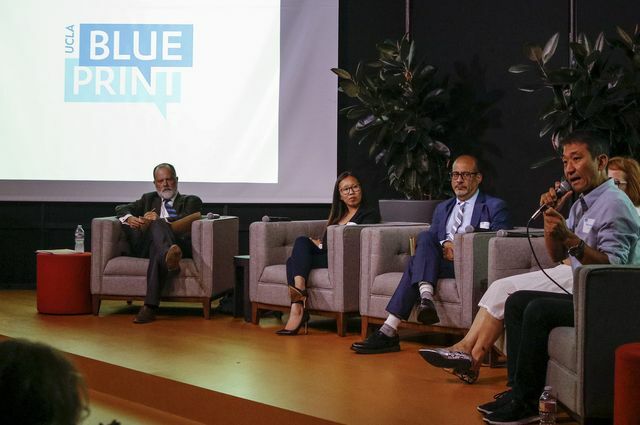 In the spring, UCLA Chancellor Gene Block formed an Immigration Advisory Council, on which Valenzuela serves, and the campus and UC system have supported immigrant students. “There’s a lot we can do,” Valenzuela said. “Their history on our campus is real.” The council will continue to do what it can to mitigate fallout from federal immigration decisions, he added. For the civically minded in the crowd, the panelists said there is no time like the present. “Organizing at the street level is what I think is the next answer,” Valenzuela said. To change the narrative on DACA and immigration issues, Zhou said everyone can contribute, and that “organizing is huge.” Think about the terms you use when discussing these issues, she said. “I am sort of the medical student people talk about positively in their narrative,” but what about field workers and others, she wondered. Zhou, who was born in Mexicali, Baja California, Mexico, but to Chinese parents, moved to Calexico, California. when she was 12. Her story defies easy categorization — 100 percent Chinese, but a native Spanish speaker. Zhou questioned why it was easy for her as someone who looks Asian to walk along checkpoints, even though she’s also from Mexico.